That’s what Quinlan sophomore Rachel Taylor had to say at the end of the Quinlan Case Competition, an annual contest that puts undergraduate students’ problem-solving skills to the test before a panel of Loyola alumni and business leaders. Her team, Coast to Coast, returned for a second year of competition on Monday, October 5, and emerged victorious over a record-breaking 90 students from 23 teams. The students had only four days to translate their classroom knowledge into a real-world business solution for a case focused on a sustainable supply chain for IKEA. * The Lawrence Metzger Award for Excellence recognizes the highest scoring team made up of all first-year or second-year students. Quinlan’s case completion is unique as it is open to undergraduate students from every school and discipline. Quinlan Student Services Coordinator Alex See, who coordinated the competition, said that competitors ranged from one of the 11 business majors that Quinlan offers to students with majors in psychology, math, and English. But the competition is especially valuable for business majors, as case analysis is quickly becoming a standard practice in job interviews. The competition officially began on Wednesday, September 30, when students were provided with a 22-page Harvard Business School case study. Teams had to analyze IKEA’s growth in relation to a sustainable wood supply chain, and present their solution to the judges the following Monday. The Case Competition teaches business skills, as well as soft skills necessary for professional success. Asked what helped her team win, Taylor credited teammate Austin Tolentino’s leadership. For his part, Tolentino credits his team’s win to the feedback and support of last year’s judges. He said last year’s judges encouraged team Coast to Coast to participate again. Also returning to competition this year—but on the opposite side of the table—were judges Austin Nugent (BBA ’13) and Davi Aragao (BBA ’14). 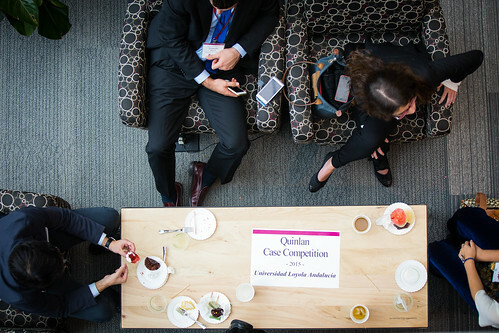 The duo was part of the winning team in the inaugural Quinlan Case Competition in 2012. Nugent is now a credit portfolio manager with Northern Trust, and Aragao is a FX trader with HC Technologies. During the competition, the judges focused on the thinking and analysis behind the solutions presented by the students. Nugent noted that the discussion segment of the competition is a particularly valuable experience for students.